I've learned you are coming to Paris; please do not meddle in my affairs, I should be most upset and the consequences might be very unpleasant. This collection of seven original Holmesian plays, never before published in book form, features the Great Detective's encounters with none other than Fantômas, the French Lord of Terror, Count Dracula, Father Brown, Theodore Roosevelt and more. Renowned playwright and translator Frank J. Morlock also adapted Lord Ruthven the Vampire, The Return of Lord Ruthven, the Arsène Lupin vs Sherlock Holmes stage play and Frankenstein Meets the Hunchback of Notre-Dame for Black Coat Press. 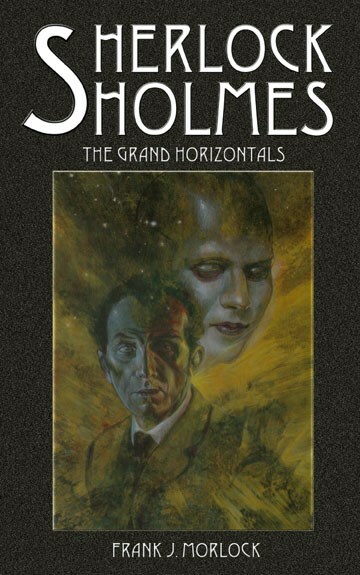 Black Coat Press has published Sherlock Holmes: The Grand Horizontals, a collection of short plays by Frank J Morlock, who adapted Arsène Lupin vs Sherlock Holmes: The Stage Play into English. The title play, which would be fun to stage, pits Holmes against the super-crook Fantômas and involves two notorious real-life courtesans of the period, Caroline Otero and Liane de Pougy. Both, I think, feature in Michael Harrison's book A Fanfare of Strumpets â€” but the literal translation of the phrase Les Grandes Horizontales seems rather clumsy. In The Tomb of Merlin Holmes meets the young Father Brown, but the author seems ignorant of the situation and organisation of the Roman Catholic church in Victorian England; and Essex transmutes into Derbyshire for no apparent reason. I prefer The Mulberry Street Irregular (Holmes and Teddy Roosevelt) and The Silent Treatment, which isn't really a Holmes piece at all, but should work very effectively as a dramatisation of Poe's The Tell-Tale Heart.